Boatbuilding Tools, what tools are needed to build a boat. What tools are needed to build a boat? Boatbuilding requires a surprisingly small collection of tools. Stitch and blue boatbuilding requires even fewer tools. 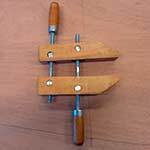 Here is my list of "boatbuilding must have tools" and a few "it would be nice to have" list. Most people have some of these already. If you need to buy any remember that in tools you get what you pay for. Stay away from the really cheap stuff. If you buy plans, particularly plans that are aimed at non professional builders, the designers will usually include a list of tools they think you need. It is very surprising to find that many so called square tools are not square. 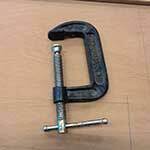 This can cause a lot of grief when laying out boat parts and squaring things up after clamping. Make sure the squares are square and compare the rulers and the measuring tape to see that they are exactly the same. Many are not. Sometimes the tape measure is slightly inaccurate at the end hook. It's useful to have imperial measurements on one side and metric on the other. If you're working from a kit and not from plans you probably don't need the drafting squares. 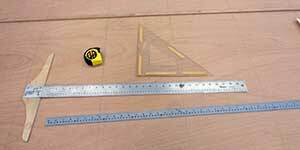 You need a set square or a combination angle ruler to check that things are square. They often have a little level included which can be useful. Check that they are square, many are not. An easy way of checking if a square is square is to draw a straight line and mark a point roughly in the middle. Then using your square make a right angle line perpendicular to the line you drew starting at the point you chose, be careful to line up your square on the line you made. Then, turn your sqare around and draw a right angle starting at the same point. If your square is good the second line will be right on top of the first. If your square is not accurate you will be able to see the second perpendicular line. I also have a machinist's square that I really like to check right angles. A level is essential when setting up a boatbuilding frame and for making sure that your pieces are level, particularly when epoxy is setting. When you get your level check that it is accurate by reversing the level and measuring the same spot with the level facing the other way. If it's different, your level is lying to you. 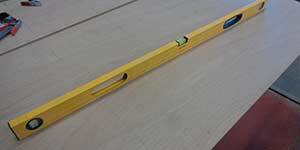 A carpenter's bevel is very useful if you need to measure angles and reproduce them. Not absolutely necessary but I use mine often enough that I would miss it if it was not there. 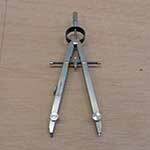 A compass is a great tool to have around if you need to quickly measure and reproduce a distance. Useful to draw circles too. If you are working from plans then essential, if you have a kit then not. There is a great deal of individual preference in choosing cutting tools. These work very well for my boatbuilding needs. 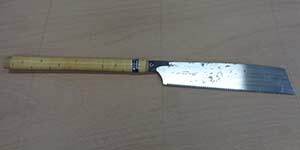 Many boatbuilders have chosen to use Japanese Crosscut saws instead of traditional Western crosscut saws. Whichever you prefer you will need a sharp saw. A western saw would have about 10 teeth per inch I think. I've been using Japanese saws for years and like them. They are light, fast, don't make a large slot and can cut flush. I don't think they can be sharpened easily so if you get one make sure that they carry replacement blades. They stay sharp for a long time. I bought mine in a Korean street market 16 years ago and I've only used up 2 blades. Many of these saws come apart and fit nicely in a toolbox. 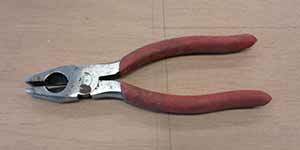 They can be used to cut gentle curves or to cut straight lines. It takes some getting used to because they cut on the up stroke as you pull the saw. Western saws cut on the down stroke so have to be made stronger and thicker. 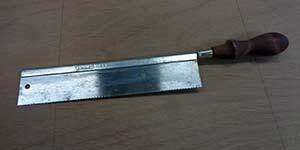 I find myself choosing this saw often enough to think it's a must have boatbuilding tool. It's easier to control than the Japanese saw and makes a more accurate cut. Or rather I make a more accurate cut with the back-saw than the Japanese saw. You decide if you need this one. If you do any other woodworking then it's a useful tool. It's great for cutting joints such as mortise and tenons and dovetails. I use my jig saw more often than any other saw I own except the table saw. This is the tool I use to cut out any curved part in plywood. It is almost essential in stitch and glue boatbuilding. 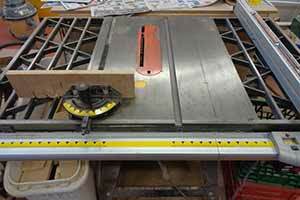 A good jig saw will also cut an almost perfect straight line given a guide, or in the hands of an experienced user. Match saw blades to the job. I like to use metal blades when cutting plywood to get a smoother cut with less burr. It's good to experiment with your wood and choose the most appropriate blade. Variable speed is really nice. This is one tool you don't want to skimp on if you can. Although it is possible to work without a sander I would not. My random orbital sander is one of my most used tools. The better quality sanders last longer. You get what you pay for. I got this tool and found that I simply could not live without it. It is spectacular at removing epoxy drips and uneven spots. It is also the best tool I have used to remove the ridges of fiberglass cloth edges. This is not an essential tool really but it has saved me hours of sanding. This is a carbide blade and lasts much longer than just a regular scraper. I was so pleased with my scraper I wrote a page about it. You will find a couple of chisels essential. 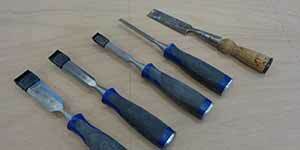 These came as a set of 4 Marple chisels packaged as a promotional item. You really only need a couple maybe 1/2 inch and 1 inch. I also use an older more beat-up chisel where the better ones might get damaged. Don't buy cheap chisels they don't stay sharp and they either chip easily or the tips bend. If you have a few old beat up chisel don't give up on them. They can often be re ground and sharpened. Planes are pretty much on the top of my must have list. 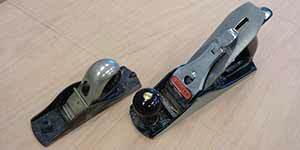 The smaller block plane is one of the most useful quick adjustment tool you can have, It quickly rounds an edge, cuts a shaving off to fit better, makes a quick angle. 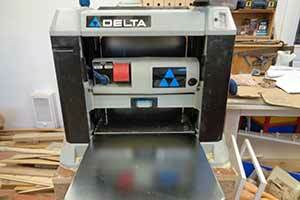 The larger smoothing plane can be used to smooth wood, taper or flatten boards. 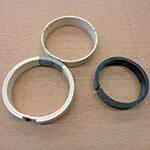 It is also really useful to round spars and is almost essential when making spars and masts. The key to using a plane is keeping it sharp. Chisels and Planes are very satisfying tools as long as they are sharp. When you buy a new plane it is rarely ready to use. The base and knife often have to be flattened and tweaked before it gives its best service. Lots of places in Youtube will give you instructions on sharpening and setting up a plane. I think mine is a number 4 and I wish it was just a tad larger maybe a number 5. Some people really like spoke shaves. I've not warmed up to mine very much but they can be used to round and shape wood such as a tiller. A spoke shave would work well to shape an oar or round a mast. It wants to be sharp. 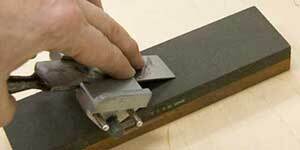 There are many ways of sharpening your chisels and planes. For many years I used sandpaper on a glass backing. It's cheap to get started and works well. I also have oil stones. The picture is of my grinder with special sharpening wheel and hand made jig for holding the tools. I have a page on how to sharpen tools. This is a skill you will never regret spending some time learning. Decide what system you want to use and get a set up for it. You will likely want a honing guide which is a small holder to keep the blade at a correct angle. Some are very inexpensive but check that they are square. Mine is just slightly off. This is a Norton combination stone that has 2 grits in combination. After sharpening I like to finish the edge with 4000 sandpaper or polish it with Woodstock D2912 Buffing Compound, Green, 1 Pound Bar I think it's chrome polish and it gives a nice shine to the edge of the tool. 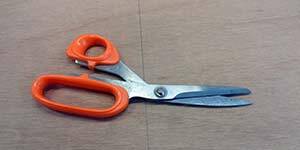 If you plan to use fiberglass you will need sharp scissors. They will eventually get dull and probably covered in epoxy. This is where cheap tools come in handy. When they stop working, replace them. You can try sharpening them but I've not had much happiness doing this. I use a wood RASP and a single cut file to shape wood. Many people like the new sure forms and Japanese rasps. This is not strictly necessary because you can use coarse sandpaper but I find a few files useful. There are many utility knives around. I think this is the most useful size. 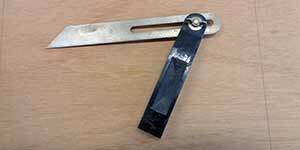 It can be used to cut thin material and can be a good marking tool. I know of at least one boat builder who only uses a knife to cut his plywood. I can't imagine building any boat without a drill and drill bits. I bought both these drill bit assortments as promotions and have used them for years. I just replace them as they get worn out or break. 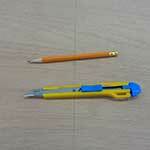 The spade bits can be re sharpened as can the larger regular bits. A very handy drill accessory is a countersink bit. 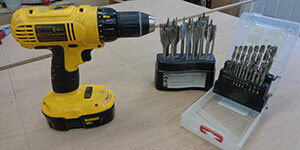 Dewalt has a set, DEWALT DW2535 3 Piece #6, #8, and #10 Countersink Assortment . There are the 3 most common size and should do you. 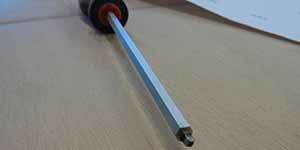 You will need a good screw driver matching the size screw your project requires, Quality pays off in screwdrivers. If no size is shown then I usually go for a number 8 Robertson screw (square hole) a Red Robertson, they are colour coded. The square head is infinitely easier to use than the star shaped phillips head. It's also really fast to have a few screw tips to use in the drill. You will need a clawed HAMMER. 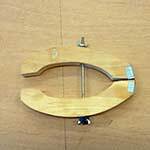 You will want a pair of plyers for general use but also to cut and twist wire in stitch and glue plywood boat construction. You will use the plyers to remove the stitches after tacking your pieces together. Anyone who has ever built a boat will tell you that you never have enough clamps. Clamps regularly go on special, stock up when they do. I use the pipe clamps when I make a mast using the birds mouth method. They can be joined to make them longer. For this purpose I use the cheapest clamps I can find because they will be covered in epoxy. 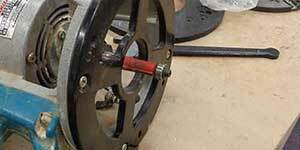 It's a good idea with all your clamps, to oil them lightly to make them easier to clean. I recently built myself a Clamp Rack on wheels. Here is how I built mine. It works very well for me. 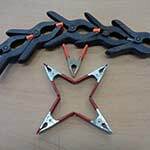 There are many designs for hand made clamps. 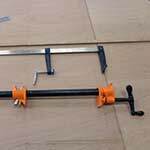 The plastic pipe slices is one of the easiest ways of getting a whole lot of clamps quickly and cheaply. If one is put inside the other then there is more pressure. I've not included things such as paint rollers, squeegees used to spread epoxy, mixing containers, cleanup stuff, spatulas and spreaders, paintbrushes, sandpaper. You can get these as you need them. These are the first tools you should get. Buy good quality protective stuff and wear it. I use vinyl gloves and an organic vapor respirator whenever I use epoxy. There are chemicals in epoxy that can trigger allergic reactions, once you are sensitized it's unlikely to go away. The effect is cumulative. This allergic reaction is a result of the epoxy reacting with skin proteins. It can also be triggered by breathing the epoxy vapours. Few people get triggered but it's a nasty thing when it happens. Uncured epoxy particularly the hardeners can be nasty as well. Once cured epoxy is very stable and poses no threat. I got an email last year from a guy who used to work in a wooden boat shop. They used resorcinol glue which is relatively safe. Several men who had worked unprotected for many years developed Leukemia. Most modern glues pose some problems the PU glues are no exceptions. They can be dangerous before setting. Nitrile gloves are more chemically resistant if you think your are sensitive. I also use gloves and respirator when painting. I don't like it but I don't want to be exposed to more than I can help. 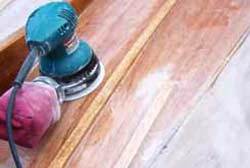 Sanding dust can also be awfully bad for you over the long run so wear your dust mask and if you are particularly sensitive or have asthma get a particulate filter and use the respirator. Goggles will save your eyes anytime you use tools. Just a short while ago I had some metal bits thrown in my face as I was drilling. The goggles saved the eyes. 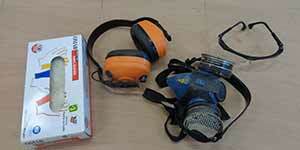 Whenever you use a sander or other noisy power tool or are hammering loudly, use your ear protection. I like the ear muff styles but you can also get little foam plugs, they are very cheap and they work just fine. They can also be washed and re used. Rince them well and let them dry before using. These are not essential tools for boatbuilding but are very useful. Power tools can hurt you. Learn to use them safely. 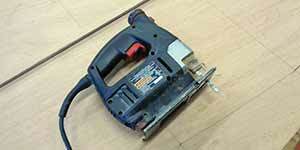 Table saws are very useful in ripping lumber down to size or quickly cutting stock. It is almost essential when cutting angles for bird mouth mast staves. Having access to a saw allows you more freedom when getting lumber. Some people swear by their band saw for similar reasons. 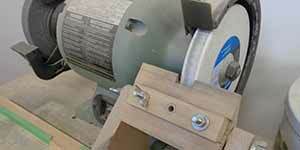 When preparing lumber for strip building or milling wood for boatbuilding a thickness planer comes in handy. You can decide on the thickness you want. It can allow you to use lumber you could not otherwise. A ROUTER is another useful tool that is not essential but is awfully nice. With the right bit a router can open a daggerboard slot or cut a panel flush to size, flatten a warped board, cut scarf joints, cut mortises and tenons and round edges. I've not included specialized boatbuilding tools here. 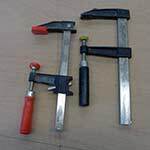 Things like special chisels, seam packing mallets and chisels, special boring tools or riveting dollies. This article is aimed at beginner boatbuilders who are wondering what they need to start. This one is smaller and lighter and less expensive. I also have this model and use it regularly. You can spend a lot of money on stones, these will get you started. Combination Grinding stone. This one is 6 inches. Larger is easier to use but this will work. You can often find them in Home Depot and other hardware store. 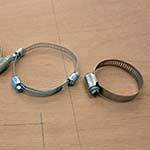 Spring Clamps: MegaDeal Too-5230 Clamp Large Heavy Duty Spring Metal with 3" Jaw opening, 4" - 6"
Organic Vapor Respirator is good for Epoxy, Resorcinol, PU, and paints. 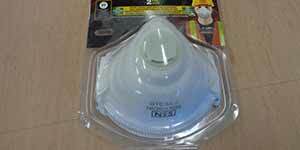 The more expensive masks will be more comfortable and possibly lighter. They will last longer. 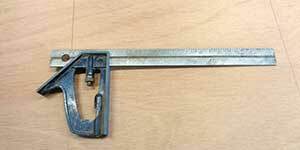 I have one of these calipers and I use it all the time. Not essential, just a very useful gadget.